There are "no plans" for a bank holiday to mark the wedding of Prince Harry and Meghan Markle, Downing Street has said. The possibility of an extra day off had dominated social media reaction to news of their engagement. But the decision lies with the government, which said there "isn't a precedent in this area". A bank holiday was declared throughout the UK in 2011 for the wedding of Harry's elder brother Prince William to Kate Middleton. 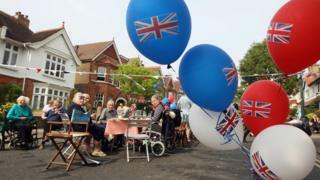 The day saw huge celebrations, with people lining the streets of London to see the royal couple on their way to Westminster Abbey. Across the country, people held street parties and crowded into parks to watch the occasion on big screens. A bank holiday was also held for the wedding of Prince William's father Prince Charles to Lady Diana Spencer in 1981. This attracted an estimated global TV audience of 750 million. After the ceremony, thousands of people cheered the couple as they waved from the balcony of Buckingham Palace. William is second in line to the throne after his father, while Prince Harry is not directly in line to the throne. Prime Minister Theresa May's spokesman pointed out there had been no bank holiday to mark the weddings of Charles's younger brothers Prince Andrew in 1986 or Prince Edward in 1999. However, a bank holiday was declared for the wedding of Princess Anne in 1973. An estimated 500 million people around the world watched the wedding of the Queen's eldest daughter to Captain Mark Phillips.